Last year’s MixTape Festival with NKOTB was fun, but the previous one was definitely better. I really enjoyed this year’s BroomBall match between NKOTB and The Jonas Brothers, but the Meet and Mingle BBQ was neither ‘meet’ or ‘mingle.’ Although it was nice to have the VIP tent to relax in during the torrential downpour, and NKOTB’s set was great but only an hour. I left my house just after 7:30am on Saturday morning. 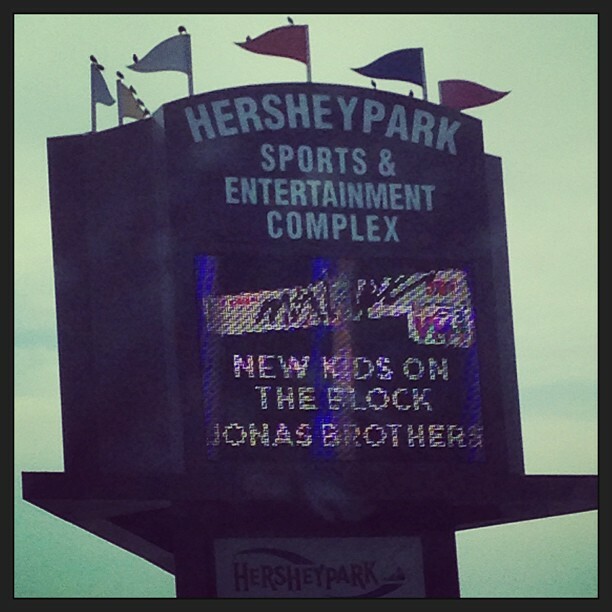 I arrived at Hershey Park Stadium, was checked in, and got my VIP credentials by 9:30. Along with my ticket, entrance to events and vip parking, I also got a tee shirt, water bottle and tote bag. I met Abbey at the Giant Center and waited for entrance into the BroomBall match. I sat second row next to the bench, so I had a great view of the game. I met Sarah and her friend, who were sitting behind me. The first match was between Hanson and the Jonas Bros. The Jonas Bros won and played NKOTB for the championship. 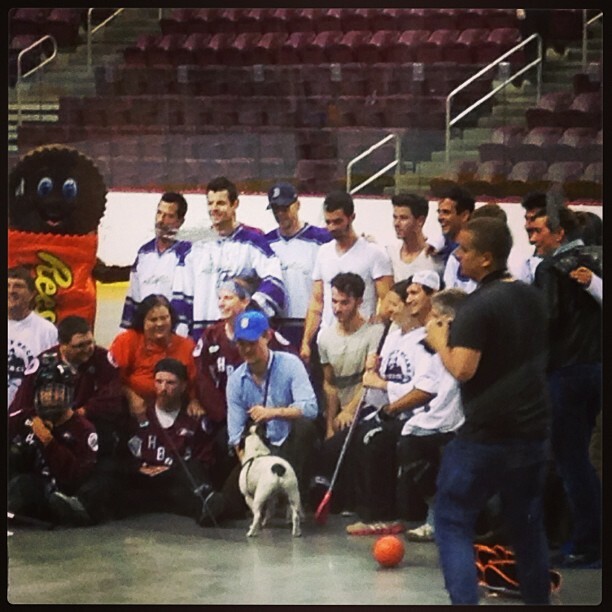 NKOTB won 2-1 because of Jordan Knight’s two goals. Jordan may have been the MVP, but Donnie’s dog Lumpy was the real crowd pleaser chasing the ball and sliding across the floor before and after the game. The entire BroomBall match was only an hour, after waiting an hour outside to get in and then another hour inside in our seats – NKOTB was only out there for a half hour. The next event was the ‘Meet and Mingle BBQ’ at 1:30, which was neither meeting or mingling with anyone except other fans. Although Donnie came out for a minute to give a few hugs, and Shawn and Nate from Boyz II Men also came out to meet the fans. Jordan waved as he came in and out from the real VIP area outside. Luckily the BBQ was inside the VIP tent because he had started to drizzle. There was a long line for food and by the time I made my plate, there were no seats left so I sat on the floor to eat. I guess being a VIP doesn’t necessarily mean you get a chair. Of course after I was finished eating, I found a nice oversized comfy chair to sit in – and I stayed there for the next several hours. I hung out with my old friend Sarah and my new friend Sarah and her friend (whom I had met at BroomBall). Around 3:30 we listened to a private acoustic performance by the Jonas Brothers. When the concert finally started, we just stayed in our comfy seats inside the VIP tent and watched on the monitors. The second band was pulled off the stage after their first song because of an impending thunderstorm. 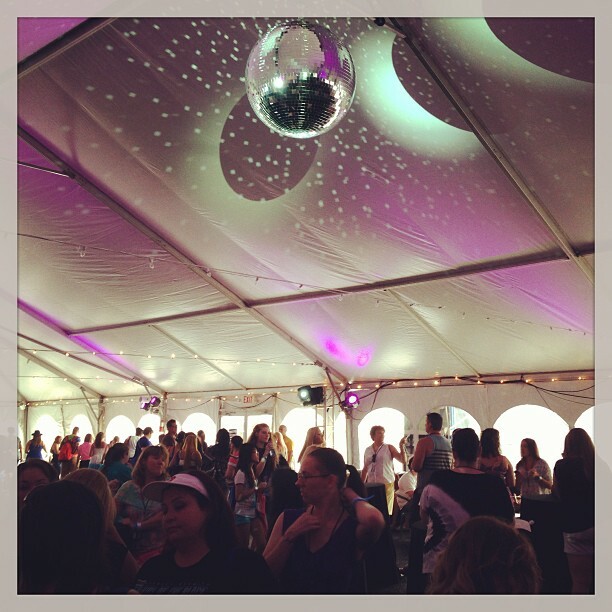 Everyone started pouring into the VIP tent and so did the rain. The astroturf ‘carpet’ was soaked. They set out snacks for everyone and had a dance contest to keep us entertained. About an hour or so later, the concert resumed. 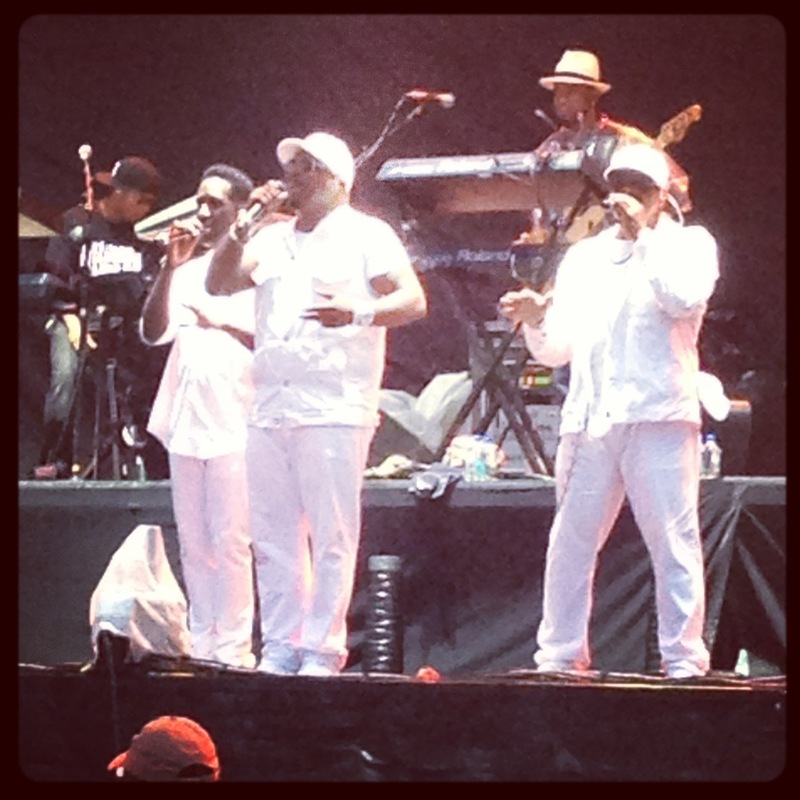 Luckily the rain subsided right after Boyz II Men took the stage, so I finally went out to my seat around 8pm. I was disappointed because they only played a half hour, just like they had on the Package Tour. I was hoping for a longer set and more songs from Boyz II Men. 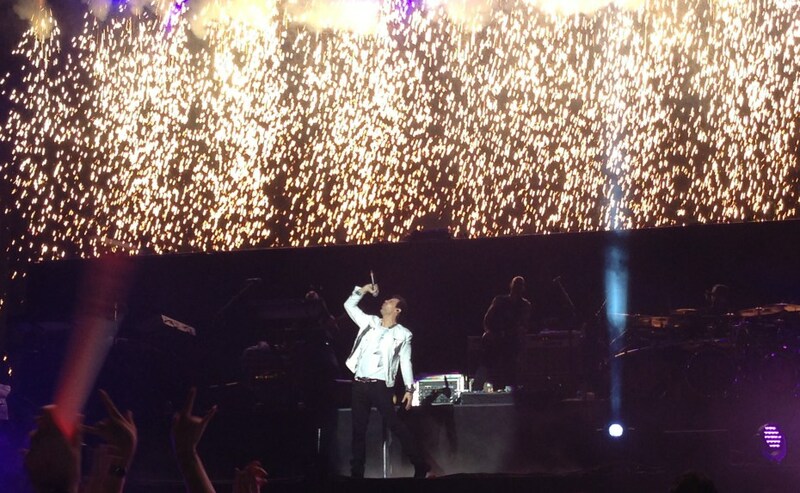 The Jonas Brothers were next, and it felt like they played forever – it was probably about an hour and a half. TLC took the stage next. There were very entertaining, but I do believe they were lip syncing which I have no respect for. NKOTB took the stage at 10:55 – they were supposed to come on at 9:55. They opened their set with Block Party. They did not play We Own Tonight or Survive You, which made me think Jon was especially nervous singing in front of the stadium-sized audience. The Whisper was also left out of the set as was the entire acoustic portion, which included my favorite Single. Glad I got to hear Single while they were warming up at the BroomBall match. During Tonight, Jordan was out in the audience in front of our section. It was a great set, but it only lasted an hour. NKOTB’s set was way too short, especially considering how long the Jonas Bros’ set was. The set list for NKOTB MixTape Festival on 7.27.13 was as follows: Block Party, Summertime, The Right Stuff, Didn’t I Blow Your Mind, Valentine Girl, If You Go Away, Please Don’t Go Girl, The ReMix, Step By Step, Cover Girl, Tonight, I’ll Be Loving You Forever, Hangin Tough. I went to the After Party just long enough to sit and relax a bit and to let the traffic out of the parking lot. Around 12:30am I headed home through spurts of downpouring, blinding rain. Just under two hours later, I arrived safely at home. To look at all of my pictures from MixTape Festival, please click here.